A new record of the neotropical otter (Lontra longicaudis) in the marine environment near the rocky reef of a coastal island in Brazil is described here, being the first published report of a semi-aquatic mammal by baited remote underwater video system. This species is not usually sighted in marine waters away from the mainland coast, and it has never been reported in this environment in this region. This individual may have increased its feeding grounds further offshore as food resources close to the mainland are reduced. Baited videos present a relatively low cost option to understand better these animals existing in different habitats, improving the monitoring for these species and providing valuable information on their distribution, habitat use, and life history. The online version of this article ( https://doi.org/10.1007/s12526-018-0868-7) contains supplementary material, which is available to authorized users. 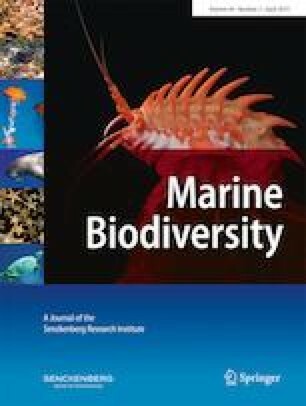 The authors are thankful to the Chico Mendes Institute for Biodiversity Conservation (ICMBio) for the permits and field support and also to the Universo Marinho Dive Company for sampling assistance and equipment. We also thank the anonymous reviewer for improving the paper and BSc. Todd Bond from the University of Western Australia for the valuable contributions in the text. The work was supported by the Boticario Foundation for Nature Protection (Project # 1043_20151) and by the National Council for Scientific and Technological Development (CNPq), Brazil.